In a surprising turn of events, the Maldives, who hadn't scored a goal until this game, put three past Nepal in the first semi-final of the SAFF Suzuki Cup 2018 to take the side to its first final since 2009. Nepal came into this game with some confidence after they topped Group A with two convincing wins over Bhutan and Bangladesh. Meanwhile, their opponents of the night, Maldives, needed some luck to get to the semi-final. The side was tied with Sri Lanka in the second place on every parameter and it took winning a toss, to take Petar Segrt's team to the semi-final. Maldives dominated proceedings immediately and captain Akram Abdul Ghanee scored from a free-kick in the eighth minute of the game. Heavy rains, accompanied by thunderstorm and lightning forced a halt in play in the 27th minute. The game resumed after almost 30 minutes and the two sides made sure no intensity was lost after the forced break. Despite coming close a few times, Nepal were unable to penetrate the Maldives' defence and Mohamed Faisal, who has enjoyed a wonderful tournament so far, was once again on top of his game between the sticks. Trying to chase a goal late into the game, Nepal were caught by a swift Maldivian counter-attack in the 84th minute and Ibrahim Waheed Hassan made no mistake and slotted the ball to the bottom right corner from the centre. 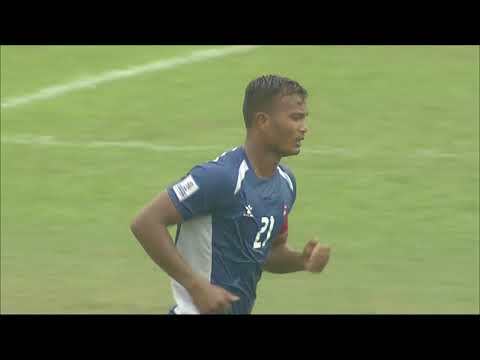 Hassan struck again in the 86th minute to make sure any hope for a dramatic comeback by Nepal was put to rest. Acknowledging his mistakes, Nepal coach Bal Gopal Maharjan said after the game, "We played very well. The weather was, of course, an issue but unfortunately, my tactics and substitutions were not effective. I am satisfied with my side's performance". "I told my team, it doesn't matter how reached the semi-final. You must reach the finals no matter what. I told my players today as well, we will win this game and we will score goals, and we did it. But big compliment to Nepal, they were a very strong opponent," said the delighted Petar Segrt after the game.